There are a few ways to tackle a hangover, depending on your intestinal fortitude. You can go all out grease-fest and a Berocca the size of your head; a rejuvenating salad and vitamin-filled wheatgrass shot; or (horror of horrors) the hair of the dog. Personally, we reckon anyone who busts out the tequila the next morning deserves a statue cast in bronze. First things first, rub lemon juice around the rim of your glass. Tip the celery salt into a flat saucer, then turn the lip of the glass in the salt, so the rim is coated. Add vodka, Worcestershire sauce, lemon juice, horseradish, Clamato Juice and Tobasco and stir them all well to blend. Garnish with your celery stick, with the leaves hanging out the glass. Start with the potatoes. Cut into slices around 1.5cm thick. Boiled them in salted water until al dente. Strain and set aside. While the potatoes are boiling, cut all your produce (onion, capsicum, bacon, chili, chives). Grab two frying pans. Start with the potato pan. Add oil and sweat onions until tender, then add the capsicum. Cook for another minute. Remove onions and capsicum. Add more oil to the pan and add the potatoes, Fry them until golden brown and then add the onions and capsicum back to the pan. Season the whole thing with the spices, salt and pepper. Once the potatoes are done. Get your egg pan hot. Add 4 tablespoons of butter and your diced bacon and cook to lightly brown, then add the onions and chili cook for another 3-5 minutes. Add about another tablespoon of butter, then crack your eggs directly into the pan and scramble with the bacon, onion and chili. Turn the heat down low and the cook the eggs low and slow. At this point, add the grated cheese. Once the eggs are cooked 90%, add the chopped chives, salt and pepper. Stir and allow the eggs to finish cooking from the residual heat. Add more hot sauce, then serve with gusto. 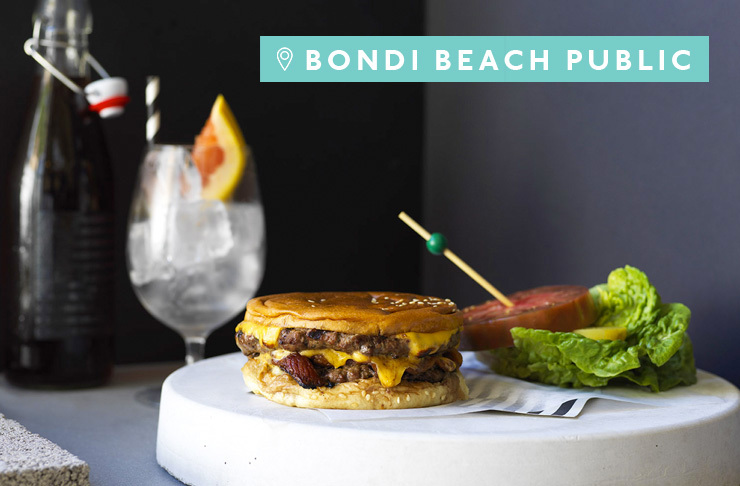 You can only get the real deal at Bondi Beach Public Bar, but in a pinch, this is how you make it at home. Grill your beef and melt the cheese over the top. In a separate pan, fry the bacon till it’s nice and crispy. Assemble with some sliced white onion, tomato, lettuce and dill pickles. Squirt on some BBPB secret sauce you nicked the last time you were there. "I have two foolproof tonics to beat the overindulgence of the silly season. The first is a congee I first tried when living in Hong Kong many years ago. It's as simple as a bowl of yesterdays rice reheated in a good chicken stock, shredded young ginger and a few slices of chicken. Depending on the severity of the hangover I find a good siracha chilli sauce clears the head. The other is simple—a good old-fashioned lemonade icy pole. The freezing cold syrupy icy pole delivers rehydration and plenty of sugar to sooth the brain." Be organised for this one. Wash and freeze some rice the night before. Whack 7 cups of water in a medium pot and bring to the boil. Add the frozen rice (no need to de-frost), stir to prevent sticking. Reduce heat t a simmer, cover and cook for about 15 minutes. Keep stirring so it doesn’t stick. Dice your egg (you don’t have to add an egg, but it helps), some julienned ginger, and shred your chicken. Add it to the cooked congee and stir. Add salt and pepper to taste. Drink with green tea (or a big Berocca). Squeeze on some sriracha if the hangover is terminal. For the hash, Gently boil the potatoes until they are just cooked, allow to cool. Grate the potatoes into a large bowl, add the onions, jalapeño, rice flour, salt and pepper and mix well. Mould into rounds using an 8cm ring cutter. To cook, deep fry in begets oil at 160.C until golden brown. For the pickles, combine the water, vinegar, salt and sugar in a large pot. Warm to just under boiling point. Place the vegetable into sterilised jars along with all the remaining ingredients. Pour over the hot brine and allow to cool to room room temperature. Store in the fridge. Assembly time. Place the fried hash in the middle of a bowl. BBQ each kransky then slice lice each kransky into 3 slices and arrange around the fried hash. Add a spoonful of mayonnaise to each hash and place a fried egg on top. Arrange a selection of pickles around each dish.